Let’s get a few things straight from the outset. One of us voted in, the other out. Neither of us are racist, nor are we members of a sneering elite. We’re not interested in blame, counter-blame or accusation. We agree on this: neither remaining in nor leaving the EU is the answer to all the questions that the people of the UK are asking. We both live in London although we’re not from London. One of us grew up in the post-industrial north of England, the other in various countries around the world. We have both spent years investing in people at all levels of society because that’s what Salvation Army officers are called to do. We both love Jesus and try to follow him. We both love politics and get involved where we are. Whilst we voted differently we share a vision of what’s next in a post-Brexit Britain. It is not theory. We know it works because we’ve done it, experienced it, seen people empowered by it, tasted God’s kingdom in it and seen communities changed by it. We describe it here as a picture of hope. And, of course, hope is an action. This article first appeared in the Salvationist magazine and is published with permission. I hear the same question all the time. Essentially it’s this: I know we should fight for social justice, but how do we actually do it? In terms of theological, devotional and motivational material urging us forward in the fight we have never had it so good. The biblical mandate for action is being preached with new fervour in the light of austerity, political upheaval and the refugee crisis. Resources are plentiful – campaign material regularly finds its way into our letterbox, email inbox and social media feeds. Dutifully we follow the instructions to pray, fundraise, get informed and click on the link to another petition website. Online activity in the cause of social change has led to the coining of a new word – ‘clicktivism’. Apparently we’re clicking like we’ve never clicked before. Yet beneath it all comes that nagging question – is any of this really making a difference? It all feels so detached. There’s surely more to justice-seeking than this. Ten years ago those nagging doubts started my journey towards a more active justice-seeking faith. What follows are four lessons I have learnt along the way. I share them with the hope they might provoke and encourage you a little. The beginning of justice-seeking is neither an action nor a programme. As an officer once reminded me: ‘We don’t do social justice – we live justly.’ In Salvation Army theology it springs from our holiness teaching, where the inner life of a believer, orientated around a relationship with God, spills over into public life. Faith may be personal but it’s never private. The inner working of our hearts is manifested in hundreds of actions and decisions we make every day. Living a just life begins with how we treat others, who we include, how we use our wealth and time. This applies to those closest to us, neighbours and work colleagues, our corps family and, by extension, the whole of humanity. The rather wonderful truth I’ve discovered is that the more I’ve chased personal holiness the more compelled I’ve been to seek a just world and the more justice-seeking I’ve engaged with the more convicted I’ve been about personal transformation. While justice begins with God, it clearly involves people. In the Exodus story the groans of the Israelite slaves rise up before God and initiate a social justice movement (Exodus 2:23–25). In today’s world we constantly hear the groans for ourselves – the low-paid worker at the food bank, the refugee, the homeless and the discriminated against. Most of us long to end such suffering. The uncomfortable truth, however, is that real justice-seeking compels us to move to the edges and experience first-hand the sufferings of others before we can act. There really is no other way. Of course when we get there we discover God is well ahead of us. 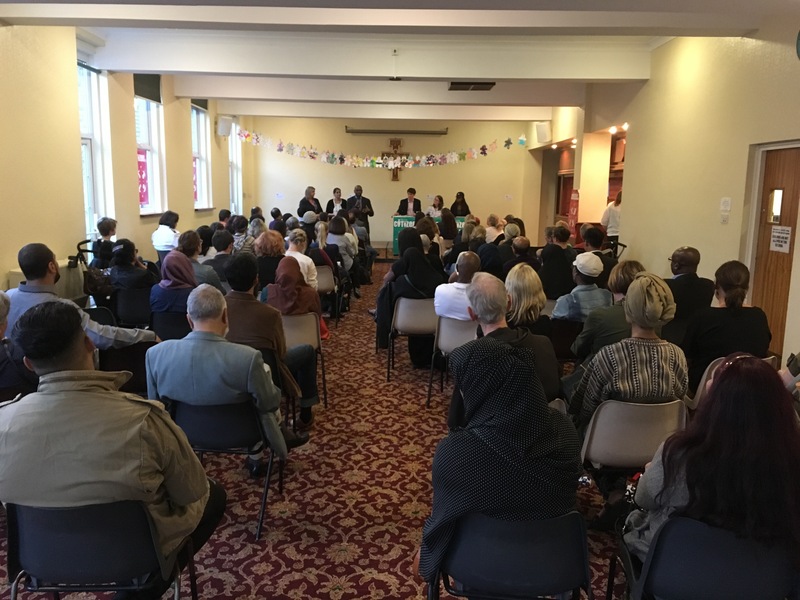 evicted unfairly, to listen to the asylum seeker who was mistreated at the immigration centre, to turn up at the mosque that has just been daubed with anti-Muslim graffiti. When we personally connect with the issue then we really start to get stuck in. Once personally involved in the sufferings of others, it is tempting to offer charity and stop there. We meet the need, bandage the wound and move on. Most likely people will call us saints. everyone call us saints and some will consider us troublemakers. This is often where we begin to falter. We like to be popular. History, however, reminds us that justice is always, always a struggle. We must purposely and prayerfully push on. life is waning, it positions us in an extraordinary place to be justice- seekers. When we look at our neighbourhoods we soon discover others who share our concerns for justice: faith organisations, schools, community groups. The work of building broad and powerful alliances of justice-seekers will position us around the table where we can speak truth to power and be heard. The good news is that I hear stories of Salvationists increasingly joining in exactly this kind of grassroots justice- seeking and of powerful transformational results. My prayer is that we grasp the moment presented to us. May God bless us with his holy discomfort to live the just life. Whilst much has been written about the life and work of Martin Luther King Jr. this is a book that goes beyond autobiography to assess the legacy of King in America today. From the outset of the book Dyson makes clear his belief that King is “the greatest American who ever lived.” He then goes on to share three central mistakes people make in relation to King’s legacy; ideas, identity and image. Rather than a chronological guide to King’s life the book is then divided into these three core areas. The chapters in the ‘ideas’ part of the book seek to reestablish the radical nature of King, particularly by exploring his changing beliefs in the last years of his life. It is fascinating to read about the changing perspectives that caused him to speak out against the horrors of the Vietnam war and organise action against poverty. In his last years King had, “… a commitment to showing the lethal links between racism, militarism and poverty.” Martin Luther King is now honored with a national holiday in America so it is easy to forget that in the few years leading up to his death his views on Vietnam, black nationalism and poverty were making him increasingly less popular with whites and also meeting with opposition from within the African American civil rights movement. The second part of the book deals with identity and chapters in this section directly address King’s plagiarism, the insatiable sexual appetite that led to multiple affairs and his patriarchal chauvinism. The writer Dyson met with criticism from some within the African American community for criticising King yet he counters that it is essential to connect with the humanity of King otherwise he becomes an unhelpful hero, someone who is so worshipped and adored that he becomes impossible to live up to and then alienating to young African American’s in America today. Finally, the book deals with how King’s image’s is used today. I personally found this section of the book less interesting than the others as it moves away from King to cover his family’s wrestle for control over his image after his death. If you’re looking for an autobiography on the life of King this is not going to be for you. However, if you know the history of King and want to read more in-depth this is an accessible academic study of his legacy. I have always loved this part of his speech and found it incredibly powerful. I loved the heart and passion behind it. I believe it was not only relevant for what was needed in the early century but I believe it is still relevant today and a call to mission for us. There are still women weeping and there are still young girls lost upon the streets and there is still a need for people to fight for and with them. There are women and young girls being trafficked around this world and in this country on a daily basis, there are women and young girls being exploited, there are women and young girls who have no safe place to live, there are women and young girls who are being abused by husbands and boyfriends. There are babies being murdered just because they are girls. There are women and young girls who are fleeing war torn countries only to be put on boats that sink or sent to refugee camps that are in incredibly bad condition offering barely any hope. It is for these young girls and for these women that we must learn to fight. As followers of Jesus Christ we have strategic responsibility to become aware of the conditions for many young girls and women not only around the world but in our local communities and we need to raise the alarm to others and we must do something with what we know. I feel like my life has been full of different experiences that have led me to having this full on passion to do something for women and because of all these different experiences whether it be working with young homeless girls on the streets of Sydney who were being prostituted by other homeless young people or whether it be the older women I met in the women’s shelter who were being abused by their lovers and husbands or the women I met in the strip clubs in Atlanta or the rescued young girl with AIDS in India who did henna on my feet for my wedding as a way to escape the red light district. Each one of these women that I have met has stirred a deep passion in me to fight for them and with them. God has a deep deep love for women, for girls and now that I am aware of all the various circumstances women and young girls find themselves in and the often horrific situations they face I cannot stand back and pretend it doesn’t happen. I must do something. So the justice conference “While Women Still Weep” held at Southwark Corps recently was my effort to do something. An effort to bring awareness to others, to create a day, a moment where God could speak and stir our hearts to action. We had speakers from International Justice Mission talking about the international efforts being made to rescue and restore, we had speakers from local Salvation Army chapters like Faith House and the Territorial department for Anti Human trafficking to give us information on local situations and how we could join the fight. A representative from Citizens Uk was there to speak about the importance of listening to people’s stories and Stephanie Chagis Bijl talked about joining the justice fight through prayer. It was a day where hopefully people came away with some practical tools and ideas on how they could join the fight. Once you know, you can no longer stand back and do nothing. Think about purchases you make and how they may be affecting women and young children around the world. Buy ethically. While Women STILL weep….I will fight. Sandra Pawar is currently the Corps Officer at Southwark Corps. She is passionate about seeing broken lives made whole, captives set free and chains of injustice broken. (Ceci est une traduction de ce billet. En tant que francophone, vous êtes peut-être peu familier avec certains concepts qui n’ont pas été expliqués dans l’autre billet. N’hésitez pas à commenter pour demander des explications ou clarifications). Il y a quelques semaines, London Citizens a organisé une “assemblée municipale” [Mayoral Assembly] à la Copper Box, enceinte sportive construite pour les JO en 2012. Le but était de rassembler 6000 citoyens pour construire des relations positives avec les deux principaux candidats à l’élection – donc le probable futur maire – et de leur faire prendre des engagements à travailler avec nous. Les deux candidats ont accepté pas mal de nos demandes. Mais cet évènement n’était pas la fin, ce n’était que le début. A few weeks ago, London Citizens organised the Mayoral Assembly at the Copper Box. The aim was to gather 6000 citizens to build good relationships with the candidates, thus the possible future mayor, and to ask them to take commitment to work with us. Both candidates answered positively to several of our requests. And this event was not the end, but just the beginning. Now that Sadiq Khan has been elected as mayor, the main challenge is to start working with him and to build good relationships, characterised by accountability. This is why London Citizens decided to welcome the new Mayor and his staff, with breakfast, on his first day to work at the London City Hall!